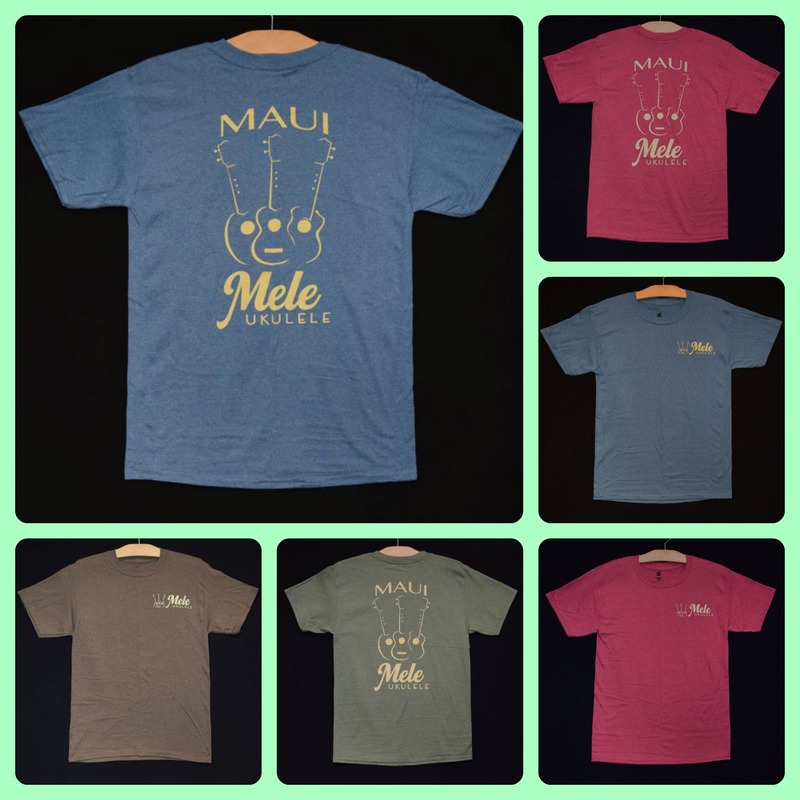 Introducing our Mele Logo T-Shirts! 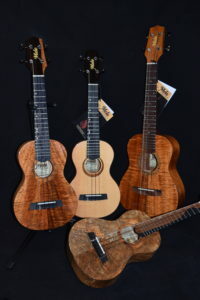 Best Ukulele Shop on Maui! Our ukuleles feature great tone and playability, top quality Hawaiian koa and other fine SOLID tone woods, and detailed inlay work. For nearly 20 years, Mele Ukulele continues to offer what can be considered among the best values in musical instruments today. 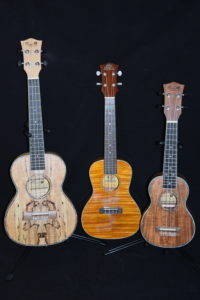 Mele Ukuleles – designed for great sound! Each Mele ukulele is designed to offer excellent playability. 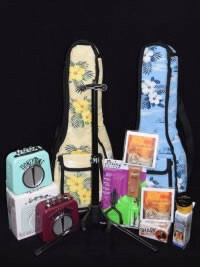 You will find Mele Ukuleles as the ukulele of choice by top Hawaiian entertainers and world famous musicians like John Fogerty, Jesse Colin Young, Steve Miller, Mick Fleetwood, Colin Hay (Men at Work), and members of Bonnie Reitt, Bon Jovi and Jimmy Buffet’s bands. We use choice tropical tonewoods such as koa and mahogany, to provide the resonance and beauty that makes Mele ukuleles so special. The most valuable and sought after Hawaiian-built ukuleles have always been made of koa wood, once known as “Hawaiian mahogany”. (Koa and mahogany are both hardwoods and members of the acacia family.) Genuine koa is found only in Hawaii and is becoming rare and expensive, so any genuine solid koa uke is an investment in the future. Our koa ukuleles, as well as having excellent sound qualities, are living works of nature’s art, each unique, with its beautiful ripples of color in the koa’s grain. Mahogany, when properly selected and cured, makes for excellent ukuleles with great sound. The great Mainland ukulele makers of times past, such as Martin, Gibson, Washburn, Regal, etc., used mahogany for most of their production. 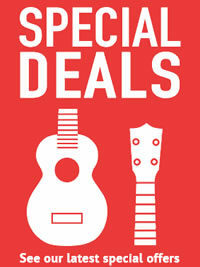 Our mahogany ukuleles are great sellers, combining outstanding performance with great value. 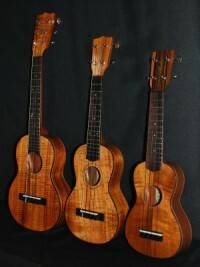 We also use Sitka spruce, Western red cedar and redwood tops on some of our ukuleles. These are the most popular woods for guitar tops and they also are excellent for ukes. Cedar imparts a warm, mellow, rich tone and spruce is the choice of many professional virtuoso ukulele players because of its volume, punch and brilliance. Cedar and spruce tops are valued for the distinctive tone qualities and beautiful and distinctive appearance they can impart to a quality hand-built instrument. ***Please note*** Due to the handmade nature of our instruments, ukuleles may vary due to variations in tone woods, wood grains etc. Every ukulele is absolutely unique and a representation of the exact model you are buying. Your ukulele may not be identical to the one pictured. It will, however, be the same model. We of course, think that all our ukuleles are beautiful but like children, they are all beautiful in their own ways. Mele ukuleles are built to stringent quality standards to provide you with the utmost in satisfaction and value. 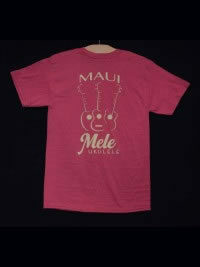 Each Mele ukulele is a beautiful example of the craftman’s work, and will provide you with a lifetime of fun and music. 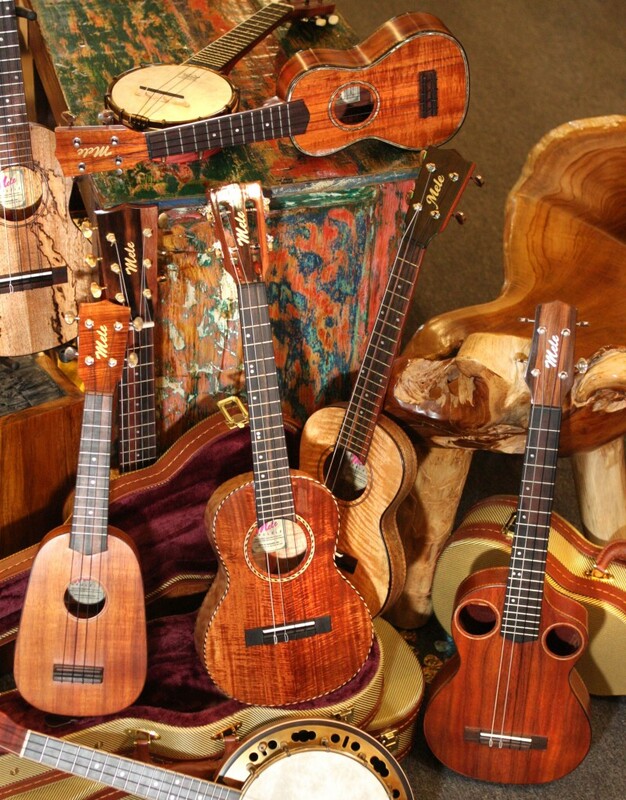 Your Mele Ukulele is a handmade solid wood instrument, just like guitars, violins and other fine stringed instruments costing many thousands! Sometimes our customers don’t realize that such instruments should be kept humidified. Please keep your Mele in its case when it’s not being played, and use a humidifier (we offer some inexpensive ones for sale) if you live in a very dry climate or heat your home. Aside from this, upkeep is very simple; wipe with a soft cloth occasionally, and slightly loosen the strings when traveling. Enjoy! There are some videos on the Taylor Guitars website that are very informative. To view them, go to www.taylorguitars.com, click on “Owner Resources”, scroll down to “Sometimes a Guitar gets Thirsty”, and you can click on the titles of the videos. Currently, they are: Humidity – The Symptoms, | Using a Guitar Humidifier, Video: Humidity – The Solution, Part 1 | Part 2. You can also click on them right here on our page to watch them on YouTube. 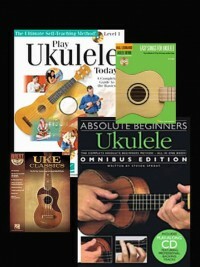 Do you have any questions or comments about ukuleles, music, Hawaii, or whatever? Let us know!